Château de Villandry is rumoured to feature the most remarkable gardens of any castle in the Loire Valley, and based on what I’ve visited in the region, I have to agree. I was impressed by the large formal gardens because they manage to achieve that elusive balance between history and originality. The gardens are a 20th century interpretation of 16th century renaissance garden ideas, and manage to remain true to the site -defined by the castle and the wider landscape where old church towers and farmed countryside recall a different era- while also injecting some imagination and freshness into a classical design. Best of all, I felt that the garden avoids the trap of being overly grandiose and impersonal, which is too often the case in other large, formal castle gardens. The very first garden at Villandry sets the tone for whole site: at the entrance to the imposing castle, instead of a grand lawn with a fountain or sculptures, visitors are greeted by the lowly vegetable garden. It’s true that this isn’t just any vegetable garden – it’s actually a superbly crafted example of the French ornamental potager, and is the garden which defines Villandry. The juxtaposition of the main formal elements against the bright colours and textured forms of common peppers, cabbages, swiss chard and annual flowers, make it fresh and interesting, without being overbearing. Moving on from the main attraction of the potager, the large grounds are divided into several spaces on different levels. The separate areas break up what would otherwise be an overwhelming space, and bring it down to a more intimate, human scale. Each space is just big enough to fulfill its purpose without being too grand. I also thought the change in levels was well done – it helped define the individual spaces without creating complete separations and thus still retaining the views both around the property and towards the greater landscape. The next areas continue to exploit the tension between formal and informal witnessed in the potager. In the garden below, incredibly blue spires of Perovskia, Russian sage, were bursting from their holding pen of perfectly manicured yew hedges. A very simple, yet very effective, composition. Further along one encounters a more a traditional formal garden, in the sense of being more serious and minimalist, but still unique. The entire garden was sunken, and invited contemplation from a high, tree-shaded moat which surrounded it. Without realizing it, we actually spent a long time sitting in this garden, watching the reflection of the sky in the large pool and just feeling its calmness. Admittedly, a lot of the time was also spent watching a little dog that didn’t tire of rocketing up and down the steep moat. I wonder how they mow that. In the upper corner of the property there is a new garden which took me by surprise – it features exuberant planting in the new perennial style, mixing together tall strong perennials with mostly equally tall and strong grasses. The overall layout is still formal, thus linking back to the other parts of the garden, but the feel here is definitely different. The garden could be regarded as slightly out of place, but I thought it fit the edge of the property with its free-flowing, slightly abandoned feel. I think it's a great new addition to the gardens, continuing the forward vision into the new century. Overall, Villandry is a stunning garden, with one foot in the era of extravagant castles and formal, controlling design, and the other foot in more loose, fun and modern planting. Definitely worth a visit. Over the last few weeks, I’ve read several blogs and listened to a few podcasts that have provided some really inspiring and thoughtful reflections on gardening. The debates range from the meaning and philosophy of gardens, to their purpose in our modern world, to the ongoing question of where gardens fit in the realm of art. Some pretty deep and insightful stuff. As someone very interested in gardening, it’s great to see that people are stirred enough by gardens, both emotionally and intellectually, to fuel these discussions. This brings me back to my own little blog, and its intended purpose. When I initially started the blog, I thought about it as just a way to keep track of the gardens I visited and my immediate impressions of them, basically a reference list I could easily come back to later. But now I’ve been inspired to think a little further. For the blog to be worthwhile, I shouldn’t be describing simply what was there and general impressions, but rather to use it as an opportunity to analyze my garden visits in greater detail, to try to distill the lessons of each garden. I’m under no illusion that my ponderings are going to be as insightful or eloquent as the other garden thinkers I’m referring to above, but my goal is learning, no matter if the process may be awkward and full of mistakes. I suppose the main question I am interested in is what exactly makes some gardens work, while others do not? Sometimes you step into a garden and it’s just magical, there is a connection and an emotional response. Others, even when the ‘required elements’ seem to be in place, just don’t manage to evoke this. It’s the immediate emotional response that I find most interesting about great gardens - to quote Penelope Hobhouse from a Vista Lectures podcast I was just listening to, you know within 10 seconds of stepping into a garden whether it's a good one or not. I also find it interesting that this response is more or less universal, and doesn’t depend on identifying with a particular garden element that may hold special significance for an individual; rather, great gardens are recognized as such by a majority of people, so they must manage to strike a common cord in all of us. I’m also not really concerned about reading too much into gardens, such as the meaning of symbolic elements or the like. To me, the garden alone should tell its story and not need an accompanying guidebook to clarify meaning to the ordinary visitor. Simply, I want to ask myself whether a garden spoke to me, and if it did, what did I feel was the reason? Well, that was meant as a short introduction to the next garden on my Loire Valley trip, but I think it’s too late to delve into that. I’ll be back in the next days with Villandry! I just wanted to take a short break from the sunny castles of last summer’s Loire Valley for an exciting news update – spring has officially arrived in Belgium! 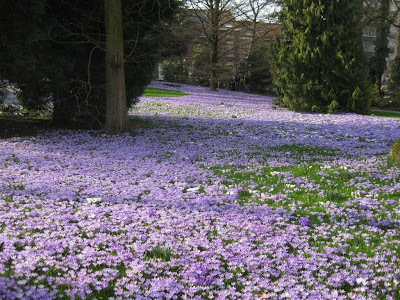 Last weekend we went to the local botanical garden in Leuven, and lo and behold, the highlight of the year was already out – the giant crocus lawn! I must say it took me by surprise. I wasn’t expecting it since we’ve had snow cover up until 2 weeks ago, and Belgium has experienced its harshest winter in most people’s living memory. 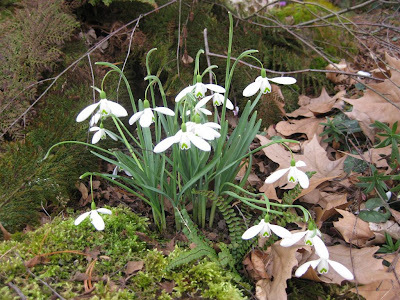 Fortunately, it seems that even after many years of being spoiled by the typically mild Belgian winters, these tiny bulbs have retained their inborn hardiness. Completely unfazed by the snow and cold, they all popped up right on time. The sight of the first fragile flowers of spring must be one of the most beautiful and happy experiences nature can offer us. I’m not sure what deep primordial cord it tugs at, but I know that it’s a prominent one in every gardener. 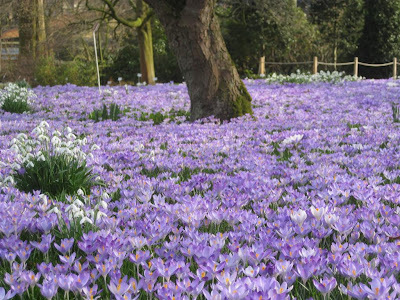 I hope that the pure, unadulterated joy of the first spring bulbs is felt just as intensely by everyone else.